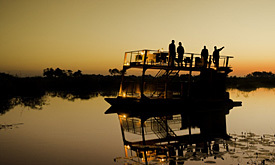 You are met at Maun Airport and transferred by charter flight to Kings Pool Camp. 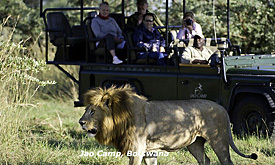 Spend two nights at Kings Pool full board basis, and including scheduled safari activities, local brand drinks. beverages. 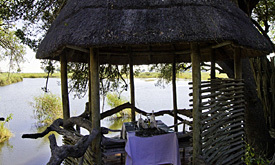 Kings Pool is situated in a private game reserve in the Linyanti area., on the western boundary of the Chobe National Park. Most of the area is characterized by open grassland, riverine forest mixed terminalia and mopane savannas. The area is most noted for its very large Elephant populations, as well as all the predators, Buffalo and an array of antelope species. Kings Pool is a 20 bedded luxury tented camp, with thatched bathrooms and one tented honeymoon suite under thatch, swimming pool and dining room and pub under thatch. 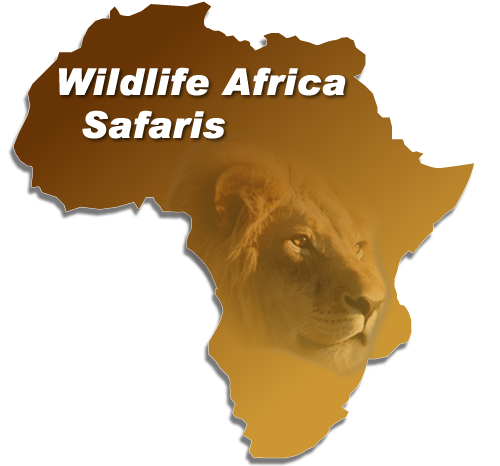 Activities include day and night game drives walking safaris and boat excursions, as well as hides for game viewing. After your morning activity and breakfast you will be transferred by light aircraft to Jao Camp on the Okavango Delta. 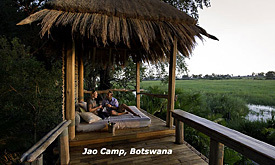 Spend two nights at Jao, full board basis, and including scheduled safari activities, local brand drinks. beverages. After your morning activity and breakfast you will be transferred by light aircraft to Mombo Camp, where you will spend the last two nights of your trip, full board basis, and including scheduled safari activities, local brand drinks. 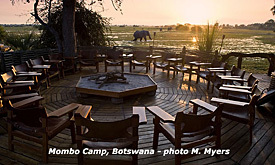 Mombo Camp is situated on Mombo Island, adjoining the northern tip of Chief’s Island, and is within the Moremi Game Reserve in northern Botswana. 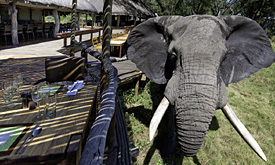 The camp offers abundant big game viewing, arguably the best in Botswana. The highlight here is the concentrations of plains game and all the predators – including the big cats! Leopard sightings are particularly good. Mombo Camp has been completely rebuilt and the new camp opened in June 2000 on a site 800m away from the old one. Mombo is built under the shade of some large shady trees and overlooks a wonderful floodplain that teems with game. The camp has nine superbly furnished, luxurious tents, raised off the ground. The guest’s rooms and the walkways that connect the rooms to the living area are up to 2m off the ground, allowing game to wander freely through the camp – but at the same time allowing for guest safety. The canvas rooms are extremely spacious and well appointed and have en-suite facilities under canvas and an additional outdoor shower for those who enjoy a shower under the stars. The dining room, pub and living area overlook the open plain in front of the camp and there is a plunge pool for relaxing in the heat of the day. Activities at Mombo include morning and afternoon game drives in open 4×4 Land Rovers. The game viewing in the area is excellent, and guests could see Lion, Leopard, large herds of Buffalo, Cheetah, Wild Dog, Elephant, Hyena, Giraffe, Wildebeest and Zebra.